FOR COLIC: Walk the horse until veterinary help arrives. If you have Banamine or other medications, do not administer them unless directed by your veterinarian. FOR CUTS and LACERATIONS: To control bleeding and to protect the wound, apply a clean well padded support bandage if the wound is on a leg. In cases of severe bleeding, pressure bandages are best. Do not apply any medications or antiseptics until your veterinarian determines whether or not the laceration can be sutured! They can injure exposed tissue and delay healing. FOR FEVER: Fevers are usually a sign of infection. Fevers above 105 degrees can be life threatening. Bathing in cold water can be an effective way to lower body temperature, as well as alcohol baths and cold water enemas. FOR LAMENESS: Sudden, non-weight bearing lameness is an emergency that requires veterinary attention. Keep the horse calm and quiet until help arrives. If the horse must be moved or trailered, a well padded splint should be applied to the affected limb. FOR SNAKEBITE: If your horse has been bitten, keep the horse quiet and call our office immediately. If you are riding, get off your horse and walk slowly back to the trailer or stable. It will take time for swelling to develop, so use this time to transport your horse to a place where they can be treated. The most serious problem is usually restriction of the airway from severe swelling if they have been bitten on the nose or face. Many riders carry short, 6 to 8 inch pieces of small diameter hose to insert into the horse’s nostrils to keep the airways open if they are riding in remote country. Do not cut or use compression on the bite as this will only accelerate the poison! Rattlesnake bites are treated with medication to limit inflammation, antibiotics and supportive care, and careful maintenance of the horse’s airway. The use of antivenom is limited by its high cost and the fact that it is usually not needed. Remember, with proper care rattlesnake bites are rarely fatal. No other domestic animal seems to get in trouble more than horses. There are reasons for this. One is that horses are a “prey” animal and are genetically wired with lightning fast reflexes. When trouble comes they don’t confront it, they flee. This becomes a problem when a horse gets it’s leg jammed under a stall door or gets caught in barbed wire. Another fact about horses is that their intestinal tracts are designed to handle large amounts of roughage. We sometimes feed less of that than they need and lots of other things like too much grain. Their feeding schedule is at our convenience rather than at optimum times for them. We keep our horses on small parcels of land and ignore the worm population that can explode under a non vet guided parasite control program. All these things have the potential for causing belly aches. These belly aches or “colics” can be mild or very serious. We at Rogue Equine are well acquainted with the troubles that horses get into. In all the years we have been in business it is a very rare day that we haven’t had to deal with some emergency. Our policy is to provide or arrange for 24 hour coverage 7 days a week, 365 days a year. If you come up against something that looks like an emergency, but you aren’t sure, call anyway! 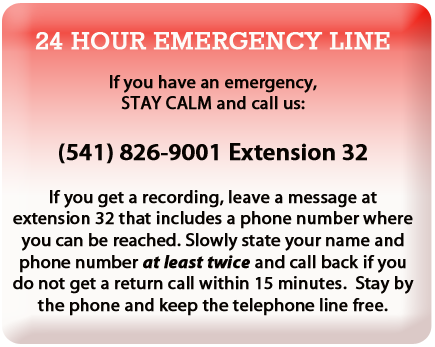 Please slowly state your name and phone number at least twice when leaving your message at extension 32. Numbers can be hard to hear over cell phones. If you have not received a call back within a reasonable amount of time, please call the ER line again. After you have called and left your number, please stay off the phone. If you want to call a friend for support, use another phone. When emergency calls come, we might be right by the phone and can often get back to you within minutes. If you are on the phone with someone else, it just delays our response time to you.